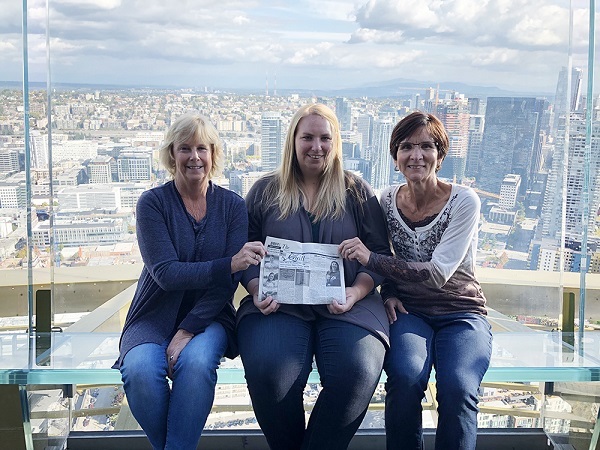 The Quill traveled to Seattle, Washington from September 22-29 with La Harpe resident Laurie Myers, her daughter Mariah, and Laurie's friend, Cathy Salata. Laurie and Cathy spent the week touring Seattle while Mariah was attending a week long zoo conference. Laurie described the weather as being perfect! Highlights of places they toured included The Space Needle, Chihuly Garden and Glass, Pike Place Market, Mount Rainier, First Starbucks Coffee House, Pioneer Square/Underground Seattle, Ferry to Bainbridge Island and Northwest Trek (wildlife area). Pictured at The Space Needle from left are:Laurie Myers, Mariah Myers, Cathy Salata.